1 of 4 Coat slow-cooker bowl with nonstick cooking spray. Place turkey in bottom and pour broth over top. Mix together curry powder, cayenne pepper and salt; sprinkle over turkey. Scatter onion, ginger and cilantro leaves over turkey. 2 of 4 Cover and cook on HIGH for 4 hours or LOW for 6 hours. Add chickpeas during last 30 minutes of cooking. 3 of 4 Remove turkey to a cutting board and cover with foil. Gradually whisk yogurt into slow cooker bowl; stir in chopped cilantro. Allow sauce to heat through. 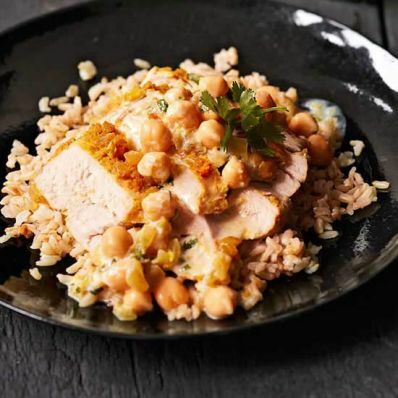 4 of 4 Slice turkey and serve with cooked rice and the yogurt and chickpea sauce.